"Barefoot in the Air", or "Rule-Breaker Wine & Food Pairings"
Posted byDave the Wine Merchant	 September 20, 2006 1 Comment on "Barefoot in the Air", or "Rule-Breaker Wine & Food Pairings"
We were flying from California to Pennsylvania for a family wedding and had been barraged with the unending series of “Do this, don’t do that, can’t you read the signs?” directives that greet air travelers. In the face of all these DO NOTS, the fact she still COULD take off her Dora sandals gave her great satisfaction. Ahhh, freedom. I believe one could spend a lifetime trying new wine and food pairings. A lucky few of us are blessed with the ability to imagine how a given wine will taste when combined with an ingredient or preparation. Even these uniquely imaginative folks take joy in a new perfect pairing. 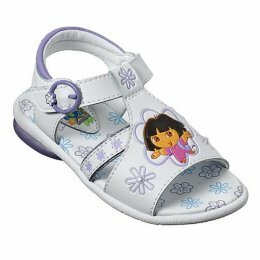 It’s the joy of discovery, like when you first realize you can still take off your Dora sandals on the airplane, I imagine. Rule #1: Eat a food you like, every day. Drink a wine you like, every day. Do them together and life will be better! Rule #2: If you can stand to make your life even better than it is when following Rule #1, you can easily do so by paying attention to how the food and wine impact each other. Once you do, you’ll discover that most white wines go best with most fish dishes, and most red wines go best with most meat dishes. Rule #3: For an easy and safe bet on good food-and-wine pairing, drink the wine of a region with the traditional foods of that region. Rule #4: OK, now it’s time to break some rules! Match Fruit Flavors – Of course, in today’s world of cocktail wines – those with alcohol above 14.5%, lots of creamy oak, and more fruit than a Carmen Miranda headpiece (right, courtesy of Hats in the Belfry) – one must take care to match the intensity of the wine’s fruit to that of the dish. Along with tannin, this element determines a wine’s body, and can range from light to full. A big-bodied wine smothers a light dish, just as a big-bodied dish smothers a light wine. I find it works best to match the fullness of the wine with the fullness of the meal – light wines for lighter dishes, big wines for meals with deep, brooding flavors. If a wine expresses a particular fruit characteristic work those flavors into your maind dish! Take a white wine with tropical fruit notes for example – I find they pair nicely with a dish containing those same ingredients as part of a reduction, salsa, ceviche, compote or side dish. These ingredients work as a bridge that allows a white wine (in this example) to nicely complement a lighter meat dish. This is because the natural acidity in a grape (or in any fruit – think of under-ripe bananas) is highest when it’s unripe, gradually lowering in concentration as the fruit ripens – increasing in both sugar (which becomes alcohol) and flavanoids – the flavor characteristics of each species. A wine low in acid is said to be “flabby” as it is missing the acidic backbone that provides basic structure to the wine. In seeking successful rule-breaker pairings, I found that a high acid wine almost demanded me to pair it with a high acid dish – think seafood with lemon, anything picatta or vinegar-based dressings or sauces. Oh, by the way, white wines tend to be higher in acidity. Huh, there’s that old dictum again, but now we know WHY white wines complement fish. Tannin – Tannin is key to a wine’s texture – how it feels in your mouth. Some describe the feeling tannin provides as one of drying out your mouth, but I prefer the phrase "tannin changes your saliva so it’s no longer slippery”. I don’t know if it’s more accurate, but getting people to taste a big red wine and then rub their tongue against the roof of their mouth is a fun exercise that serves to break down inhibitions as well as effectively communicate a memorable lesson. When pairing wine with a dish (such as the Niman Ranch beef shown above) that is naturally high in fat, a good choice is a tannic wine – which is usually a young red. There’s that dictum again. Alcohol – If you’ve ever suffered through a glass of non-alcoholic wine, you know that alcohol is a key element to the body and flavor of good wine, and is a key element to be considered when pairing it with food. But excessively high alcohol (anything much above 14%) will not complement many dishes, and leads to physical pain when paired with hot spices or peppers – like trying to extinguish a fire by dousing it with gasoline. When selecting a wine to complement your latest kitchen masterpiece, you’ll do well to look for those with alcohol levels below 14%, if you can find them. If not, try not to exceed 14.5% This is a good rule of thumb whether seeking a white or a red. Sweetness – Technically, a wine’s sweetness is measured by the amount of natural sugars that remain after fermentation. Most table wines are fermented to complete dryness (though there is a trend towards leaving small amounts of residual sugar to make a wine more approachable). But it can be difficult to distinguish between a wine with residual sugar and a wine with gobs of fruit. Grapes that are particularly aromatic produce wines that can often seem "sweet" even if a lab analysis reveals no residual sugar. Whether seeking a food pairing to complement a wine with abundant fruit aromas or one with residual sugar, my findings were the same – I found that it works best to match sweet wine with sweet food, and dry wine with savory food. With one exception – sweet wines do wonders for taming the burn from hot Asian spices! Pairing sweet food with dry wine can lead to memorably unpleasant combinations. Many people who dislike Champagne formed their opinion on experiences at wedding receptions where a dry Champagne was paired with sweet wedding cake. And since Americans learned somewhere that sweet wines were of lesser quality, and since the host wanted The Best Wine for this blessed event, “the driest champagne available!” was ordered. You know the rest of the story – dry wine, sweet dessert, gag reflex ensues. Of all the rules of thumb I can recommend, I find it safest to pair the sweetness level of the wine and the dish (or dessert) being served – the sweeter the preparation, the sweeter the wine need be. Now please, go out an break a few rules. And let me know how it goes.